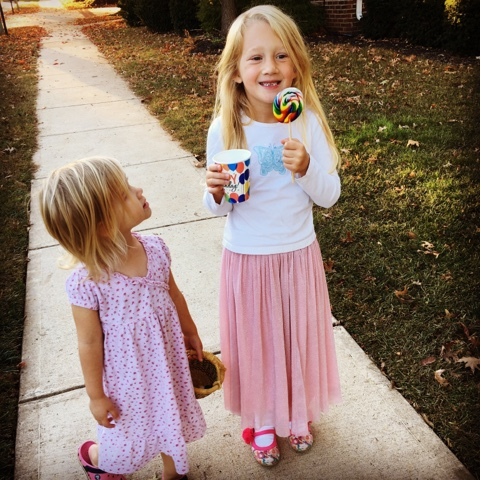 Things I love are being able to walk to a birthday party in your neighborhood on a warm fall afternoon. Coming home these two were talking a mile a minute about the party. They had the best time enjoying the freedom of play. I love that this family had a good 'ol fashioned birthday party at home. Friends came over to play games, eat cake, and celebrate their friend turning 6 years old. Walking home with a balloon (I held on to them just in case release was in their minds) in one hand and a rainbow lollipop 🍭 in the other they were so happy. If only we could all be that happy about spending time with our friends. Of course an amazing lollipop in hand does make your day seem brighter.